The Oakland quartet evolves its sound from washed-out garage rock to incisive, hooky pop on its forthcoming record, Dig Deep. Silk-screened posters, T-shirts, and drawings littered Jeffrey Cheung's narrow studio at LoBot Gallery, a DIY art space and venue named after its Lower Bottoms neighborhood in West Oakland. On a recent evening, the other members of his band, Meat Market, squeezed into the cramped workspace to help Cheung sort through the tangles of artwork strewn about his furniture. Cheung is well known in the East Bay's art scene for his drawings and paintings of goofy, portly naked men writhing about in orgiastic positions. His work adorns Meat Market's T-shirts and fliers, many of which hung on his studio's plywood walls. When not screenprinting band merchandise, painting, or making zines, Cheung plays guitar on Meat Market's sprightly yet gritty pop-punk tracks alongside fellow guitarist Ian Tatum, bassist Jake Freitas, and drummer and lead vocalist Alex Shen. 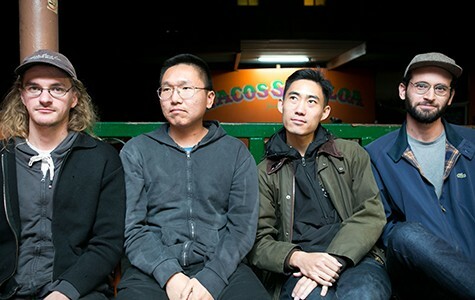 The four close friends began collaborating about five years ago, when they were students at UC Santa Cruz, and have been a mainstay of Oakland's underground music scene since the release of their self-titled LP in 2012. While Meat Market regularly plays at house shows and unofficial venues, it has also performed in large concert halls, including Slim's and The Independent in San Francisco. The band has toured with national acts, as well, and often opens for the popular surf-punk four-piece FIDLAR, which is based in Los Angeles. While Meat Market came up in the Bay Area's garage rock scene, the bandmembers contended in an interview that this label no longer suits their new creative direction. On their forthcoming record, Dig Deep (which is due out on vinyl in early 2016), they've abandoned their previous work's distortion-heavy, washed-out aesthetic and tongue-in-cheek lyrics in favor of clean-cut song structures and pensive subject matter. "A lot of the songs we played in the beginning fit into [garage rock], but none of us felt strongly about it," said Freitas. The members of Meat Market, he continued, felt "lumped into" the subgenre — which became ubiquitous in West Coast rock by the early 2010s. "[Writing the new album] was partly us trying to distance ourselves," said Tatum. "But maybe we didn't really get too far," he added. The members of Meat Market's self-effacing humor — both in person and in their lyrics — has earned them a reputation as a relatable band-next-door, which is part of their appeal. While Dig Deep isn't a radical departure from Meat Market, the new LP is rife with incisive songwriting that feels more calculated than the unbridled hyperactivity that courses through the band's first project. Cheung and Tatum's dueling guitar riffs drive the upbeat melodies, and Freitas and Shen's tightly orchestrated rhythm section fuels booming buildups and frenetic releases. But while the instrumentation on Dig Deep sounds polished, Shen's raw, strained vocals still evoke the scuzzy warehouses where the band developed its sound. Despite Dig Deep's jubilant sonic palette, much of its lyrics are about withdrawing from social interactions and into one's thoughts. In the chorus of "Hole," the only single Meat Market has released from the project so far, Shen sings, Into this hole I will go/Find comfort in what you know. "It's reflective and introspective, which is just what happens when you get older," he said. "You think about your art more, or whatever." "[It's about] going into holes, taking time to think," added Cheung. "Mental holes, emotional holes, physical holes. Sometimes you need to go deep to ..." began Shen. Realizing where this double entendre was going, the other band members yelled for him to stop. "Sorry. I mean like, yeah, I don't know," he trailed off, staring at his sneakers. In the period between the creation of their first and second records, the members of Meat Market focused their energy on ephemeral media and DIY projects so that they could experiment with their sound. They recorded tracks onto found cassette tapes from thrift stores and passed them out at shows and tested out new songs live before committing to them in the studio. In between larger gigs, they played plenty of house shows and unusual venues such as an optometrist's office ("We tried to play a lounge-y set and it sucked," said Shen), and even performed between the shelves at Adobe Books in San Francisco. Though Dig Deep has taken a long time to complete, the round-about route the bandmembers took to write it ultimately helped them develop a more sophisticated body of work, and their confidence is palpable in their new music. As Cheung put it, "At first we just kind of played, but now we're thinking about it more, which is both good and bad."